We don’t often get much snow in Seattle, but when we do everything basically stops and absurdist-theater levels of hysteria ensue, complete with ridiculous terms like “Snowmageddon” for a few inches of accumulation, which I’m sure causes the eyes of folks from the Midwest to roll their eyes so hard they can virtually see their brains. 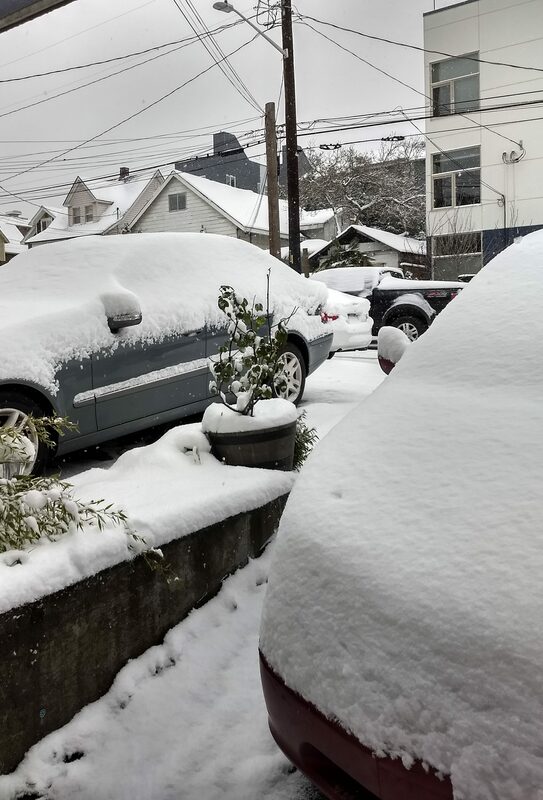 Now, part of the problem is that it just doesn’t snow very much here, and many Seattleites are transplants from much warmer places where it doesn’t snow at all, leading to the same sort of fear-of-the-unknown reaction one sees every time it drizzles in Los Angeles. And another part of the problem is that Seattle is full of steep hills which become impassable under icy conditions, thus leading to traffic snarls as people who can’t navigate without Google Maps are detoured to alternate routes. But another part is just Seattle being Seattle, which is why the only days I got in my car for the past week were Tuesday and Wednesday. Once the snow stops (the weather report says tomorrow) I’ll probably start my car to let the heat melt off the snow, and throw a few pots of hot water behind my wheels so I can get traction to back out of my driveway. But until then, I’ve got plenty of blankets, soup, supplies, booze, cannabis and writing projects, so I’ll be just fine right here in The Den. When I lived in San Francisco, I got the idea that the streets, rather than a grid that ignored slopes, should have been arranged so that at each corner the gradient (line of steepest slope) is diagonal; that way you’re never driving directly up a hill. Makes even more sense where the streets can be slippery. Wonderful article! Glad to see the common sense approach to the little snow that you recieve.